Alaska is the land of nature. Pristine forests line glass-like lakes, glaciers jut from chilled waters where whales play along shores. Juneau, Alaska’s capital, has no roads connecting it to the rest of Alaska or North America; though it accessible by plane and ferry. This makes it the perfect getaway, in the truest sense of the word—a place to realize the coexistence of humans and nature in harmony. 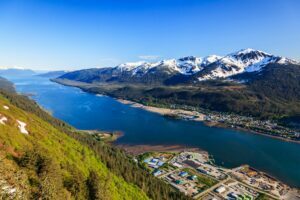 A popular cruise port city with a quaint feel, Juneau is a sight to behold for lovers of travel, nature, and adventure. The natural world is never far from where the traveler will stay in Juneau. 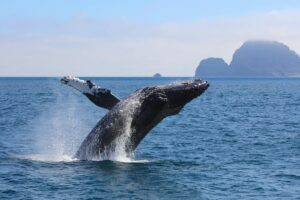 Whale watching is a favorite of most visitors, as humpback whales return from their migration to Hawaii in the winter. Not only are they seen meandering and playing through the waters near Juneau, but the newly birthed calves join the parents in a delightful display of nature at its finest. But humpback whales aren’t the only ones having fun in the water. Orca whales, Dall’s porpoises, sea lions, and harbor seals are found along the coasts of rainforests and glaciers. There’s nothing quite like experiencing marine life of all kinds reveling in their lives from a boat tour around Juneau. On land, Juneau is full of gorgeous and serene forests mostly untouched by the modern world. A popular activity for many travelers is to zipline through the canopies of rainforests. These forests are full of old-growth trees dating back 400 years. Along with the great views of a rolling tree line, the traveler can also sometimes spot animals in their day-to-day activity. Speaking of animals, a trip to Admirality Island will do the visitor well. Often referred to as “Fortress of the Bears,” Admirality Island lets the traveler visit a protected habitat of approximately 1,500 brown bears. Outdoor activities are where Juneau, and the surrounding area, shines the most. The traveler can kayak along coasts showcasing lush forests and snow-tipped mountains. But even more impressive are the glaciers, specifically the Mendenhall Glacier. The awe of realizing the grand size of this glacier from a canoe is an experience to not be missed. For those that love to fish, Juneau is an amazing place to catch salmon and halibut while taking in the sights from fully equipped boats. The downtown area of Juneau lies at the very foot of Mount Juneau, with a waterway that cruise ships and ferries use on the other side. Juneau is a prime location for those that wish to see untouched and unsoiled nature up close. That’s why Shoretrips wants to get the traveler out there and on a tour of the gorgeous forests and serene waters surrounding Juneau. KETCHIKAN CITY TOUR AND TOTEM BIGHT TOUR: This trip will take you to the outskirts of Ketchikan, as Totem Bight is a lovely 15 minutes from downtown. 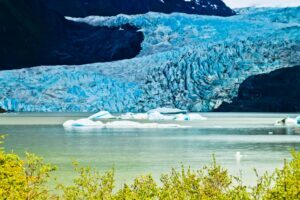 COMBO TOUR WHALE WATCHING & MENDENHALL GLACIER: On the way to Mendenhall Glacier, you will learn about the history and trivia of this famous state capital. WHITE PASS TRAIN AND DRIVE: We are delighted to offer this combination using the popular train trip one way and a slow, scenic mini-bus ride in the other direction–both giving you a wonderful display of Mother Nature at her finest. TONGASS RAINFOREST HIKING EXPEDITION: Venture to the Tongass National Forest for a two-hour exploration of Ward Lake. You’ll take the Ward Lake Trail, where you’ll observe the wildlife in this area and learn about the Tongass from your local guide. ALPINE ZIPLINE ADVENTURE: Imagine yourself suspended above the ground, gliding from one uniquely-themed platform to the next through the Alpine Rainforest Canopy. HIKE & FLOAT COMBO: Your adventure begins with a scenic coastal ride to Dyea, the famous gold rush town. Here, you’ll embark on an active 2-mile hike through beautiful forest on the Chilkoot Trail. JUNEAU CITY TROLLEY AND MENDENHALL GLACIER EXCURSION: After an interesting tour of the distinctive architecture and angled streets that mark historic downtown Juneau by historic trolley, you will visit the remarkable Mendenhall Glacier. WHITE PASS SUMMIT TOUR BY BUS: Your comfortable motorcoach parallels the train en route to the White Pass Summit and will pick you up and deliver you right back to the cruise ship pier.